Gov. 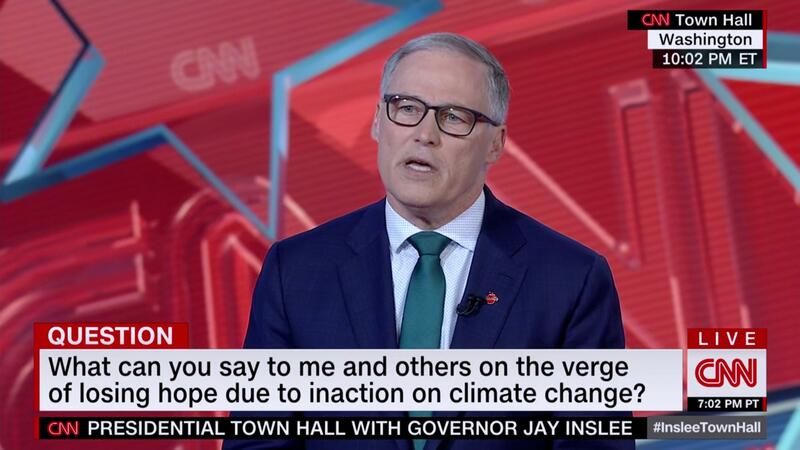 Jay Inslee mixed praise for progressive changes in Washington with criticism of one of the state’s biggest employers and even stronger words for President Donald Trump in a town hall meeting Wednesday on CNN. After an opening pitch for an aggressive campaign against climate change – a subject he returned to regularly in the one-hour session – Inslee suggested the rest of the country would find answers to some of its thorniest problems by looking at what Washington has done or is trying to do. “I do believe my state can be a template,” Inslee told a studio audience at American University in Washington, D.C.
How to prevent bankruptcies brought on by high medical bills? It would help to have a public option for health insurance, like Washington is exploring, he said. It should also lower the age for Medicare and allow people to buy into that federal health care program. How to help college graduates with crushing debt? Washington has increased student aid and extended it beyond tuition with programs that also help with room and board. “One of the changes we’ve done is reduce tuition,” he said. That claim usually prompts Republican legislators to point out – correctly – they were the ones that came up with that idea and fought for it against Democratic resistance. What about legalizing marijuana? Washington’s experience has been “an unalloyed success, better than many people expected and the warnings about health problems and rampant crime haven’t happened, said Inslee, acknowledging he did not support the initiative when it was on the ballot. The country should decriminalize marijuana, he said, noting he is the first governor to offer pardons to people with marijuana possession convictions. Gun violence? Washington has passed gun control measures at the ballot box by confronting the NRA and developing consensus on issues, he said. Inslee also touted his vote for a semi-automatic rifle ban in 1994, even though he believed it would cost him his congressional seat. He did indeed lose his Eastern Washington seat, which represented Yakima and the Tri-Cities. “I provided one of the critical votes to get it over the top. I lost my seat, but I have never regretted that vote because I do not believe any congressman’s or politician’s seat is more important than any child’s life,” he told the audience to loud applause. In his effort to set himself apart from the still-growing field of Democratic presidential challengers, Inslee said the nation needs a president who would make fighting climate change “Job One.” He’d push for 100% clean energy, which he said would create millions of new jobs, and provide government help for people in jobs tied to fossil fuels to transition to a changing economy. He took repeated shots at Trump, saying at one point Democrats should work next year to make him “a blip in history.” Asked by moderator Wolf Blitzer if he considered himself part of “the resistance” Inslee went farther. Large corporations should not be able to threaten to leave a community if they don’t get tax breaks or pit one city against another when looking for a new location, he said. Blitzer noted Inslee backed an $8.7 billion tax break for Boeing in 2013, and then reduced its workforce after receiving it. Did he make a bad deal? But he added he was “very hopeful” Boeing will be able to fix the new plane’s problems. If he won a spot on the debate stage, he would make sure Democrats debated how to tackle climate change, he said. “And I have committed myself body and soul to that effort,” he said. Inslee is on a one-week campaign swing that will take him through Iowa, New Hampshire and South Carolina, key early voting states in the presidential selection process. Published: April 10, 2019, 11:56 p.m. Updated: April 11, 2019, 12:07 a.m.